?With forceful and engaging style, Cohan describes what makes technology companies like Hewlett-Packard so successful....Any executive aspiring to market leadership should read The Technology Leaders.? As organizations emerge from an era of epochal downsizing, managers are beginning to realize that repeated cost-cutting is no longer the path to sustained profitable growth. Clearly, a new strategy is called for. 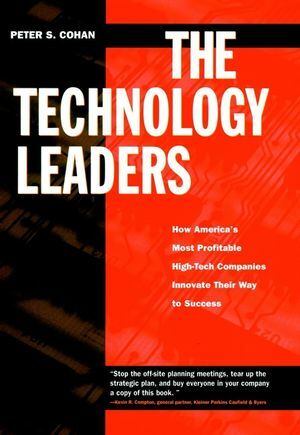 In this landmark work, Peter Cohan details the practices of today's most vital, prosperous companies -- America's high-tech leaders -- and demonstrates how other companies can follow their remarkable example and thrive in a hypercompetitive marketplace driven by rapid product innovation. PETER S. COHAN is president of Peter S. Cohan & Associates, a management consulting firm headquartered in Marlborough, Massachusetts. Specializing in both strategy and investment consulting, his clients include global leaders in the telecommunications, on-line information services, computer networking, biotechnology, pharmaceuticals, and oil services industries. Cohan received his MBA degree from the Wharton School.